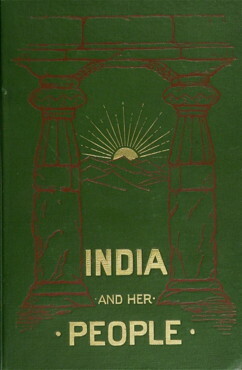 Published by the Vedanta Society in New York, India and Her People (1906) by Swami Abhedananda featured six of the author's lectures delivered before the Brooklyn Institute of Arts and Sciences on or around 1906. The lectures are titled as follows: "The Prevailing Philosophy of To-day"; "The Religion of India To-day"; "The Social Status of the Indian People: their System of Caste"; "Political Institutions of India"; "Education in India"; "The Influence of India on Western Civilization, and the Influence of Western Civilization on India"; and, "Woman's Place in Hindu Religion." The book includes an introduction by Franklin W. Hooper, the Director of the Brooklyn Institute of Arts and Sciences.